We Have a New Owner! Please see the Blog Page for an introduction. Enjoy sailing on the breathtaking waters of the Atlantic Ocean, off the coast of world famous Cocoa Beach, or through the calm, protected waters of the Indian River Lagoon. Whether you are just getting your sea legs or a veteran sailor, Beachside Sailing is your destination for sailing and seafaring off East-Central Florida’s shorelines and estuaries of the Intracoastal Waterway. Contact Beachside Sailing today to book an excursion and get underway! We are an ASA certified sailing instruction and certification facility, offering sailing lessons ranging from basic beginners’ courses to more advanced theory and navigation skills. Our classes include ASA certifications 101, 103 & 104. Not sure if you even like sailing? No problem! 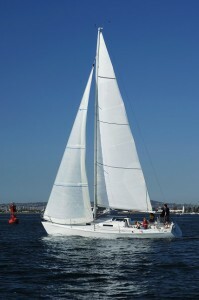 We offer a general Introduction to Sailing class at an unbeatable rate you won’t find anywhere else. 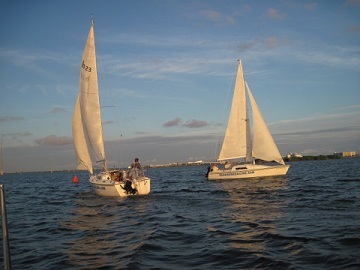 We are located at Harbortown Marina in Merritt Island, FL, just a few minutes from Cocoa Beach and Port Canaveral. We are within easy reach of Orlando and the associated theme parks. Our location makes for a perfect vacation destination for tourists and locals alike in the East-Central Florida and greater Brevard County regions. We conduct all charters and rentals by reservation. Call us at 321-624-5537 to book!